Peoria, IL - The Bradley Braves (10-10) (4-5) faced a tall task in the league-leading Drake Bulldogs (14-7) (9-0) Sunday afternoon at Renaissance Coliseum. Headed into this one, the Bulldogs had a 30-game win streak in Missouri Valley games. The Braves were looking for their first home win since December 28th against Western Illinois. The three pointer would be a major presence in the opening quarter for Bradley. In fact, three shots from behind the arc is how the Braves started the game. A three from Danielle Brewer followed by two threes from Gabi Haack. Haack's second three had Drake ahead 13-9 at the 4:21 mark of the first quarter. One more three in the quarter from freshman Jailynn Lawson would set the score at the end of the first quarter. The Bulldogs were ahead after 10 minutes, but not by much - they lead 17-14. Drake got off to a hot start in the second quarter, going on a 17-4 run for the first 5:22 of the second quarter, capped off by a three from Becca Hittner, giving the visitors their largest lead of the game at 19, 37-18, with 4:38 remaining in the first half. The Braves would outscore Drake the rest of the quarter 7-2. With the first half in the books, the Bulldogs were ahead of Bradley 39-25. The third quarter saw the Bulldogs maintain a substantial lead, but the Braves were bound to make a run. That run started at the 3:19 mark of the quarter, when Anneke Schlueter hit a three to put the Braves within 13 of Drake, 54-41. After Schlueter's shot, the Braves would outscore the Bulldogs 8-5. By quarter's end, and with just the fourth quarter remaining until the end of this one, the Braves had closed the gap to 10, trailing 59-49 after three. The last 10 minutes of the game was back and forth. The Braves even got within three of the Bulldogs, when Schlueter hit another three to make it 64-61 in favor of Drake with 7:01 to go. It got back to a 10-point game with 4:04 to go, when the Bulldogs' Brenni Rose hit a shot from distance to put the visitors ahead 75-65. After a free throw by Danielle Brewer, the Braves were able to hit some long-distance shots of their own before this one finished. A couple of late threes from Gabi Haack and a three from Brewer wrapped up the Bradley scoring for the day. The final score favored the Bulldogs, 84-75. After the game, Bradley Head Coach Andrea Gorski attributed her team keeping the game close to their three point shooting. The Braves would finish the game shooting 13 for 28 (46.4%) from behind the arc. "We got the shots we wanted, but we have to make those. Then we started making them. We shot pretty well from the three point line in the second half. That's a percentage we could've won with." Drake came into the Bradley game averaging 15.7 turnovers per game, while Bradley averaged 14.8 per game. At the game's end, Drake had committed 18 turnovers to Bradley's 13. Gorski thought that her team's efforts up and down the court had a lot to do with forcing Drake to nearly commit 20 turnovers. "No one really presses Drake. I thought we did a good job in spurts. Just one time, we pressed them and didn't get back, and it resulted in a layup. We wanted to be a little bit more aggressive." The 2nd-year head coach had some praise for a specific five she had on the floor at one point. In fact, that four consisted of mostly freshmen - three freshmen and two seniors to be exact. Those five were Danielle Brewer, Anneke Schlueter, Gabi Haack, Emily Marsh, and Nyjah White. "I thought that group of Dani, AK, Gabi, Emily, and Nyjah - they really got us a spark and gave us some really good minutes in the second half." Gorski did acknowledge the offense of Drake, one that now averages 82.4 points per game. "They're a really good passing team. You can't leave all those layups on the table in the first half and expect to beat a team like Drake." Coach Gorski did go on to say that she is ready for the back end of this home stand. "I'm just looking forward to these two games next weekend. We can't look past Valparaiso. We played really well on the road there, but they're going to be ready for us. We have to have a good solid game plan on Friday." A number of notable numbers came out of this one. Bradley finished with four players in double figures, led by Danielle Brewer (20 points). Anneke Schlueter passed former Brave Leti Lerma for the all-time Renaissance Coliseum scoring record. 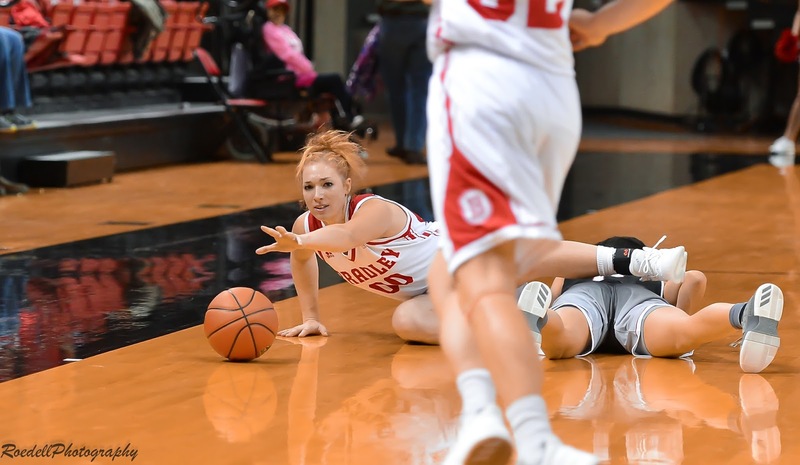 Gabi Haack moved to third all-time among Bradley freshmen in three point attempts, and was already third all-time in threes made. The Braves as a team made 13 threes in the game. The Braves will host Valparaiso in their next game. The last time these two teams met, Bradley was victorious in Valparaiso back on January 7th by a score of 88-69. Round two of Braves-Crusaders tips off at 2:00 pm this Friday from Renaissance Coliseum.